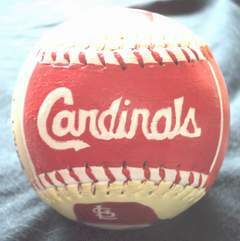 This Legends Hand Painted 2006 World Series Baseball features my original paintings of three St. Louis Cardinals. 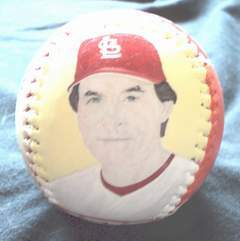 Side one is my close up painting of Cardinal manager Tony Larussa. Click here for a closer look. 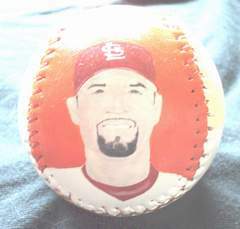 Side two features my close up painting of Cards first baseman Albert Pujols. Click here for a closer look. 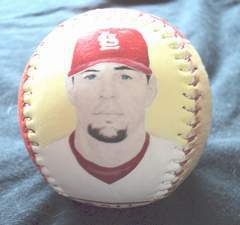 Side three has my close up painting of the Cardinals center fielder Jim Edmonds. Click here for a closer look. 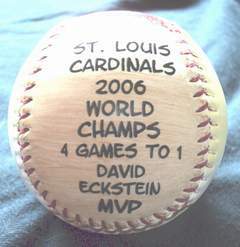 Side four shows some 2006 World Series stats. 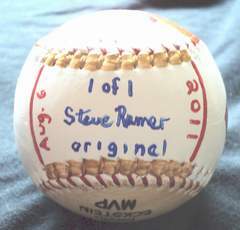 Side five, which is the top of the baseball, has my hand painted "Cardinals" in team colors as the winners.